Hope you had a fabulous weekend and a great week so far. Believe it or not, last weekend was my one and only weekend at home this month. And it felt so freaking good. Steve and I spent some QT together, which was lovely, since we haven’t had much of it lately. 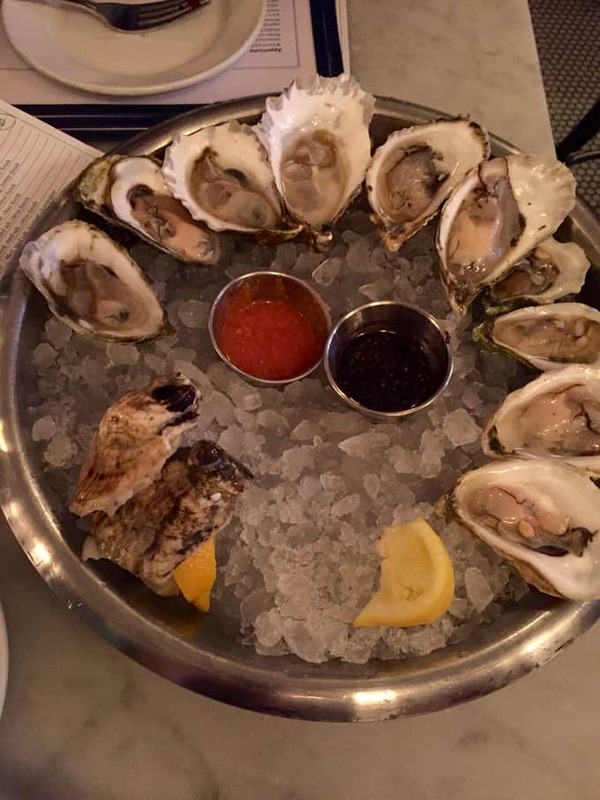 We stopped work early on Friday to make it on the wait list for Neptune Oyster (side note: we’ve attempted to eat there two other times and both times they couldn’t seat us until 10:30pm) and we made it! 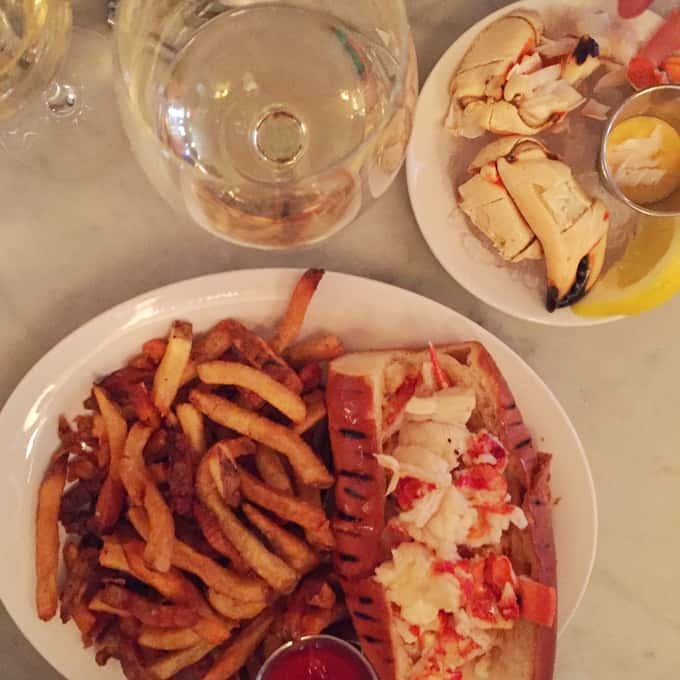 The local oysters were mouthwatering and the lobster roll was the biggest I’ve ever seen/eaten. 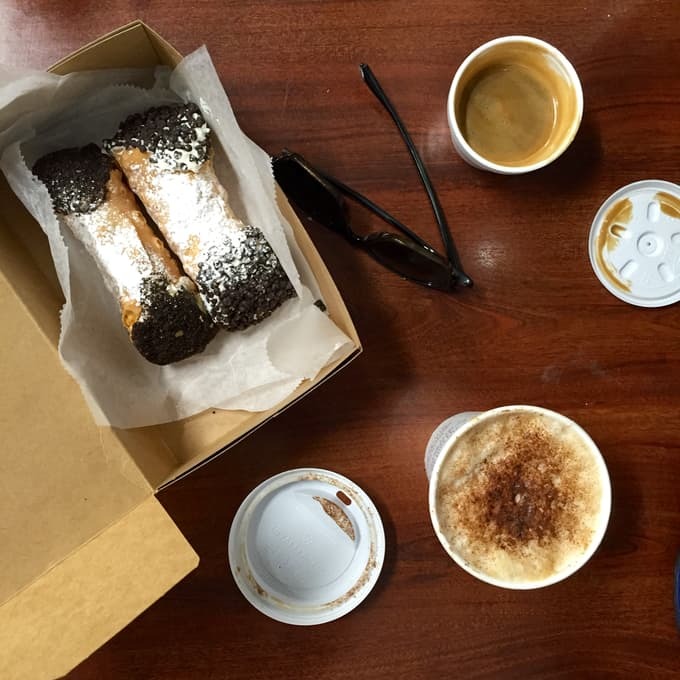 Since we were already in the North End (Boston’s Italian district) and I hadn’t had a Mike’s Pastry cannoli in years, we had to make a stop. Then Saturday we set up shop at a cute little coffee shop/cafe in our old neighborhood that I used to frequent to work on wedding stuff (so ready for this day to be here already and for Saturday wedding planning to be over!) and ran errands downtown. We then laid low Saturday night and it was so nice to not have to run anywhere and to just relax for a change of pace. Sunday, we went to the beach for the first time this summer. One of the things I love about living in New England is our close proximity to some of the best beaches in this country. I don’t have pics of the beach but I do have a pic of the ice cream we got afterwards! 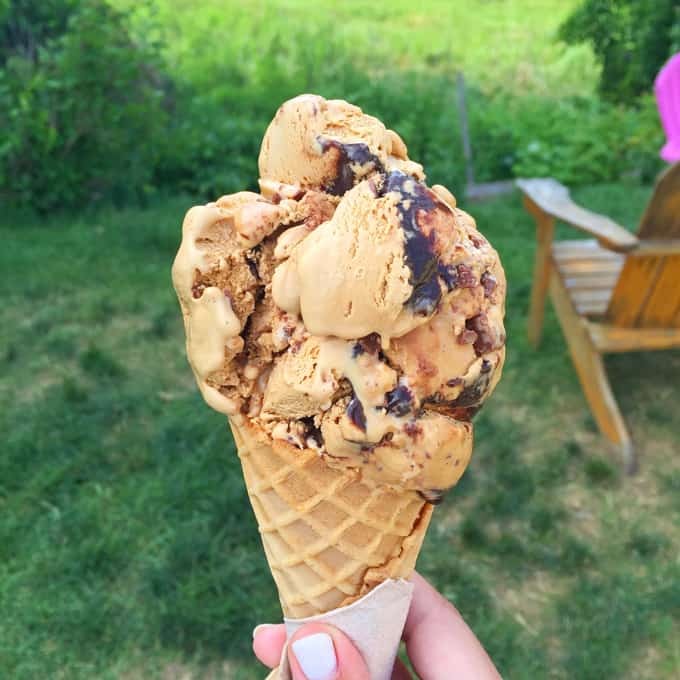 🙂 This ice cream stand in Essex, MA, DownRiver Ice Cream, is the best around, IMO. This weekend, we’re heading off to NYC – Steve is working at Fancy Food Show and I’m going to my friend’s baby shower. I haven’t been to the city in over two years so I’m really excited to get my NYC fix. We even bought tickets to see The Color Purple on Broadway which just won best musical revival and best actress at the Tony’s. We would have loved to see Hamilton but I’m pretty sure it’s sold out for like the next five years or something. Oh wait…you didn’t know I was a closet musical theater junkie? And performed all throughout high school and a bit in college? Yep, true story. Alright, now that you’ve gotten my quick life update and know my closet secrets, let’s talk food. This month’s Recipe Redux theme was to redux another reduxer’s recipe. And I knew exactly which Reduxer to feature – my dearest friend, RD colleague and masterminder, Jenna Braddock. Jenna is one of the sweetest, most genuine people you will ever meet. She has such a big heart and she gives that to her family, #TeamBraddock, her friends and her blog readers each and every day. Her blog is called Make Healthy Easy and her recipes do just that – they are easy to follow, made with simple ingredients and are family-friendly. I’ve had the pleasure of spending some QT in-person with Jenna this year, outside of our monthly group Skype calls, and it’s been so lovely getting to know her better. I haven’t told her this before but she is an inspiration to me for when I become a Mother someday. Her unwavering commitment and dedication to her family above all else is something I admire. Ok, I’ll stop gushing about Jenna now and get on to sharing one of her recipes :). 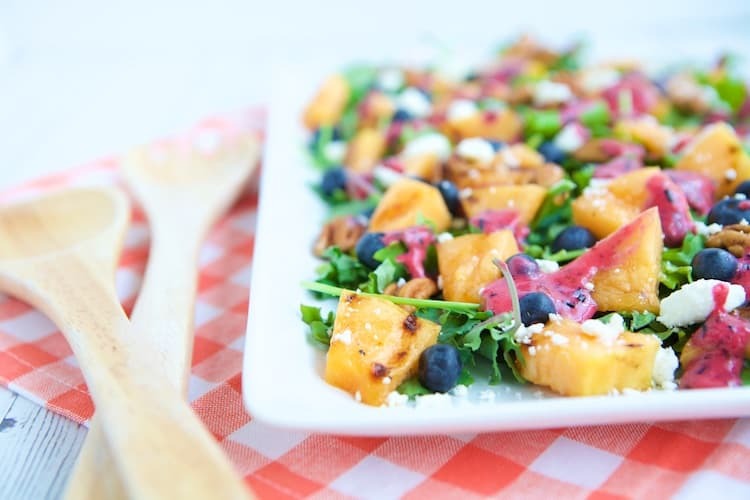 One of my favorite recipes of Jenna’s is her grilled cantaloupe salad with blueberry ginger vinaigrette. First of all her photography is gorgeous and was enough to inspire me to try it. And sure enough, the recipe didn’t disappoint. 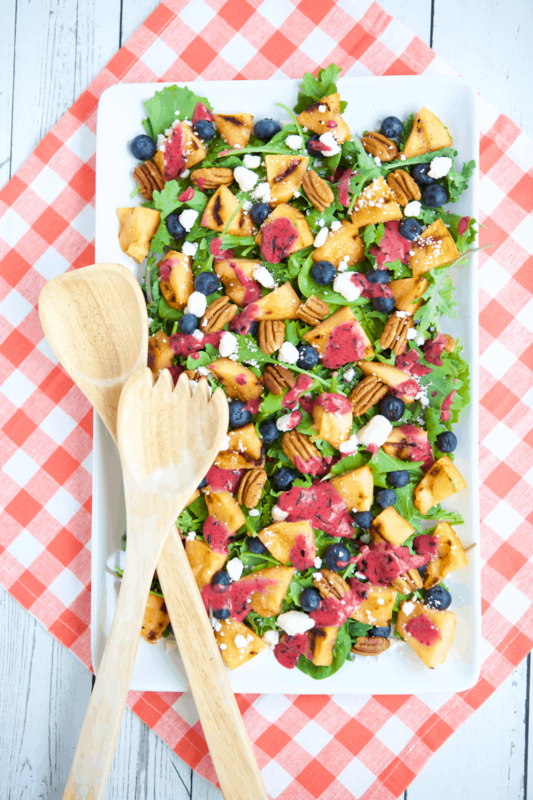 Grilled cantaloupe, blueberries, pecans for crunch and goat cheese for creamy mouthfeel – all topped with a refreshing and vibrant blueberry ginger vinaigrette. Plus, Jenna gives a super helpful tutorial in her blog post on how to cut up and grill a cantaloupe. Have you ever tried grilling fruit? It’s a total game changer. Grilling helps to caramelize the naturally occurring sugars in the fruit, leaving you with a more concentrated sweet flavor. Grilled fruit is delicious as a dessert topped with ice cream or yogurt, on its own as a side, as a topper for burgers, or on top of a salad. If you’re not sure how to grill fruit, be sure to read Jenna’s tutorial. And follow #MakeHealthyEasy for all her tips to make healthy living easier. Tell me, have you ever tried grilling fruit before? What about cantaloupe? This salad looks amazing! I am going to be making this soon. Gorgeous salad, love all of the summer colors. This will be great for the July 4th! Thanks, Lauren! Jenna creates beautiful recipes! I have GOT to try that salad! It looks fab!